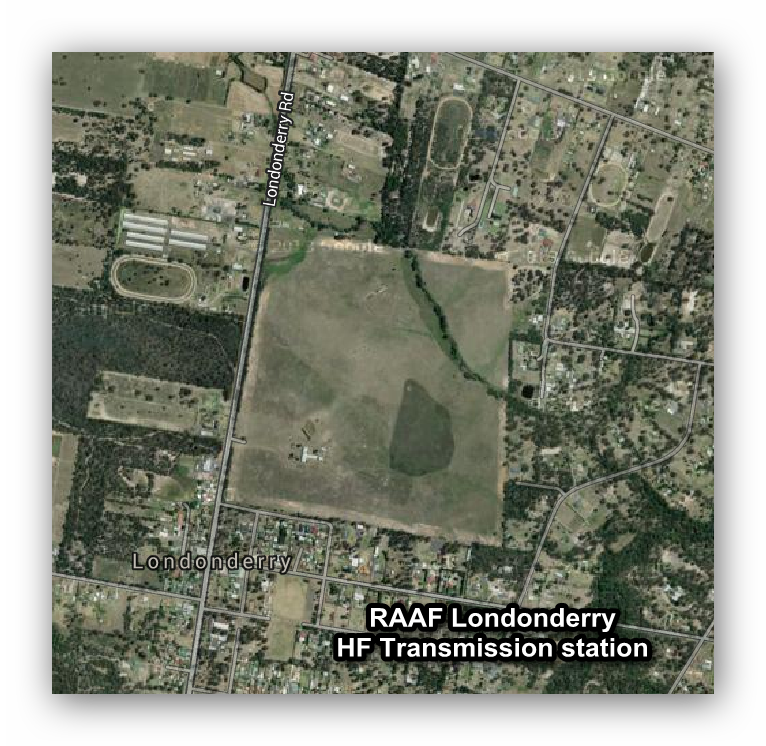 RAAF Londonderry Telecommunications Unit - and the nearby "drop zone"
To provide air traffic control at the RAAF’s Richmond base, a high frequency transmitter was established at Londonderry in the 1940s, which was upgraded in the 1950s with the onset of the Korean War and fighter jet aircraft, simultaneously pushing the civil HF transmitters to a new site at Llandilo. Whilst this site is sometimes referenced as a possible emergency landing strip I have found no firm evidence to that effect. 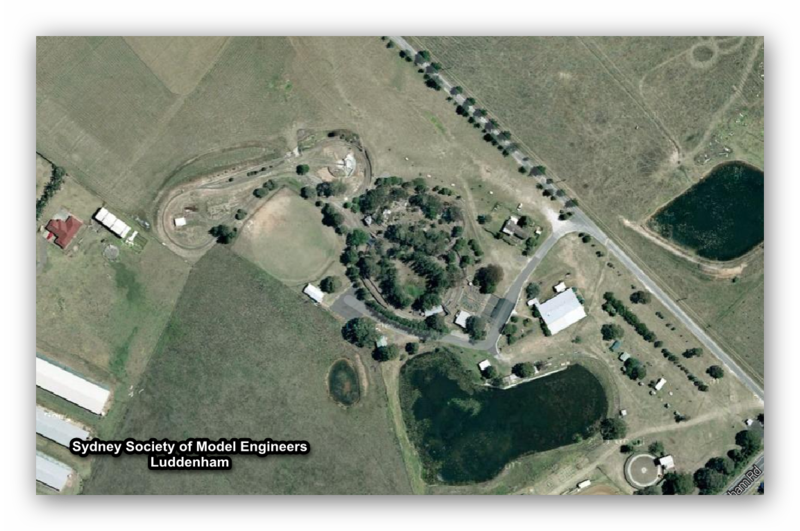 This is the current site as it appears on Google Maps in 2014. The RAAF has recently switched to a new, more remotely distributed communications system. 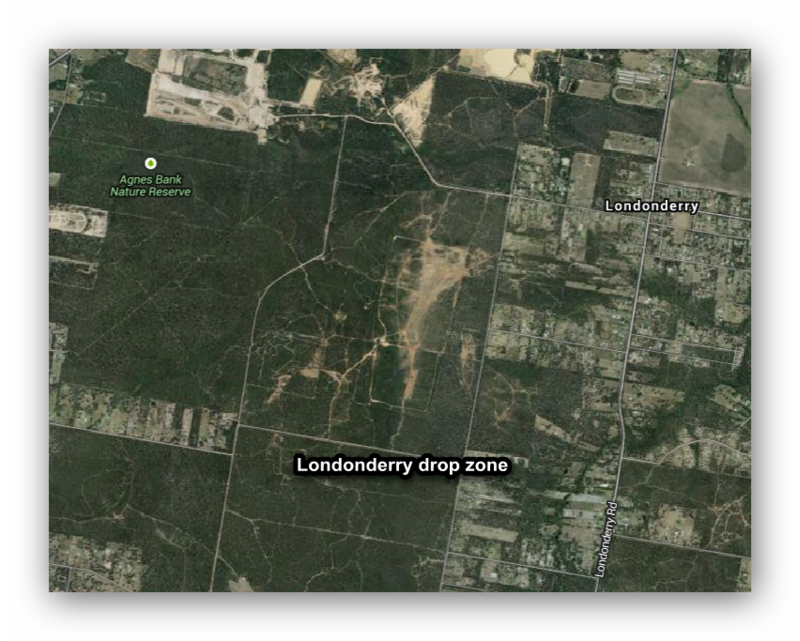 Also at Londonderry, to the west and south of the HF station is the "drop zone". Where the RAAF and presumably the Army practise dropping and catching things. Big things. Best stay clear. 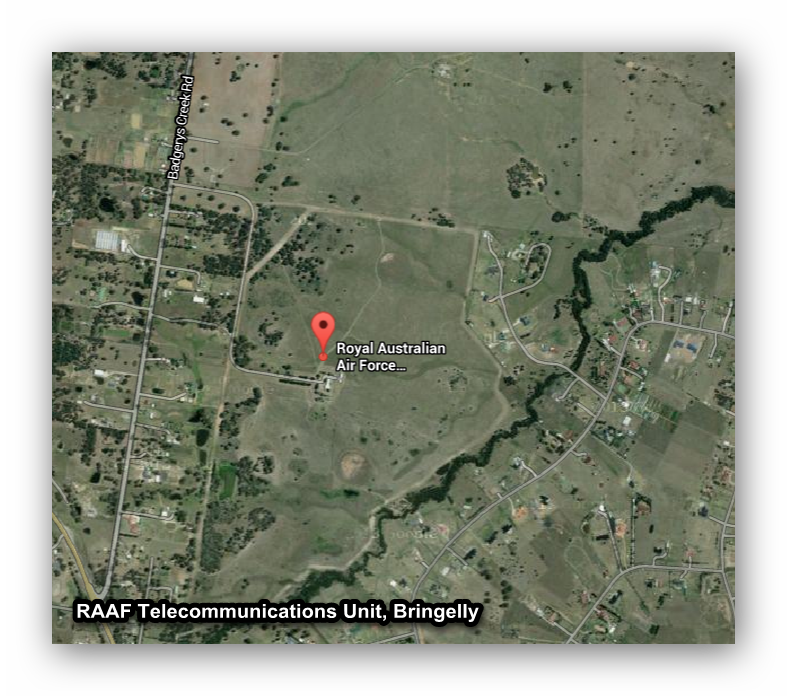 For more HF radio adventures check out RAAF Bringelly. And DCA Llandilo. And RAAF Wallgrove. 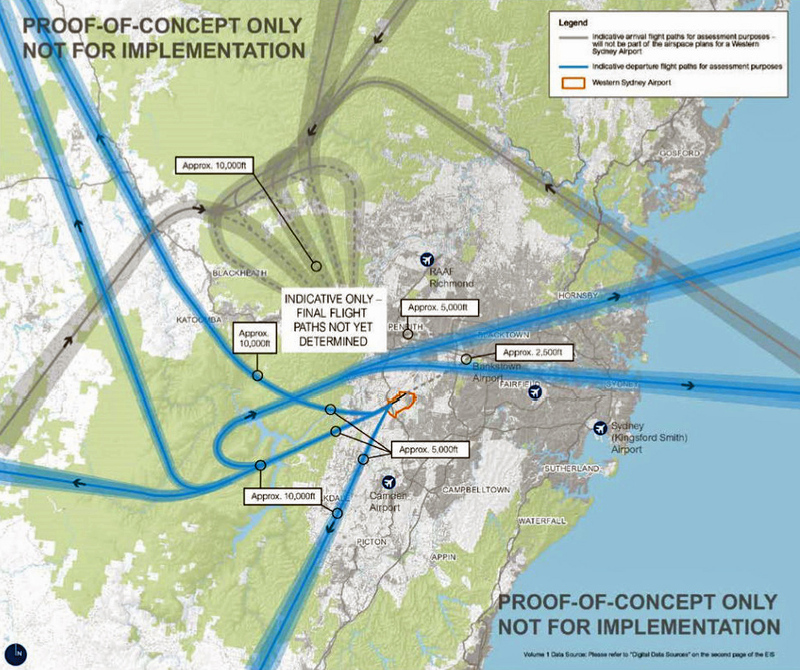 Visit the full list of Sydney's airfields. 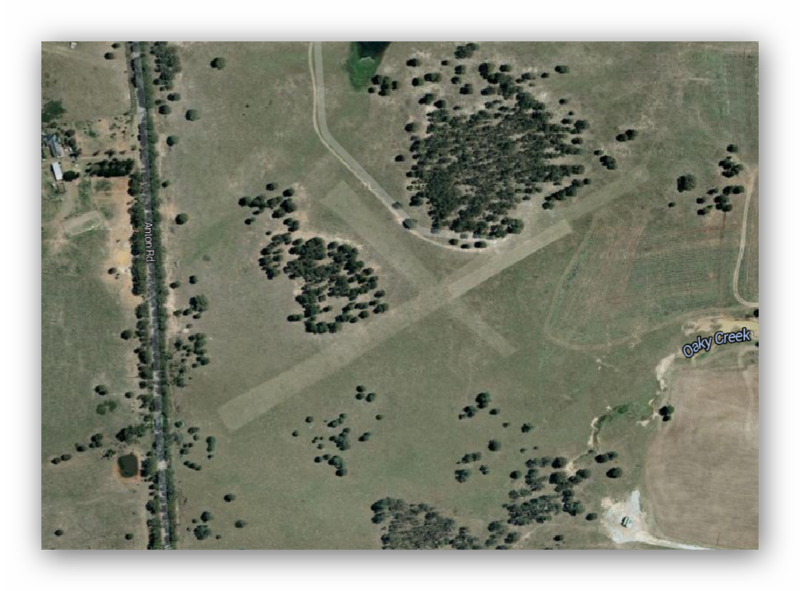 RAAF Bringelly Telecommunications Unit - and emergency landing ground? 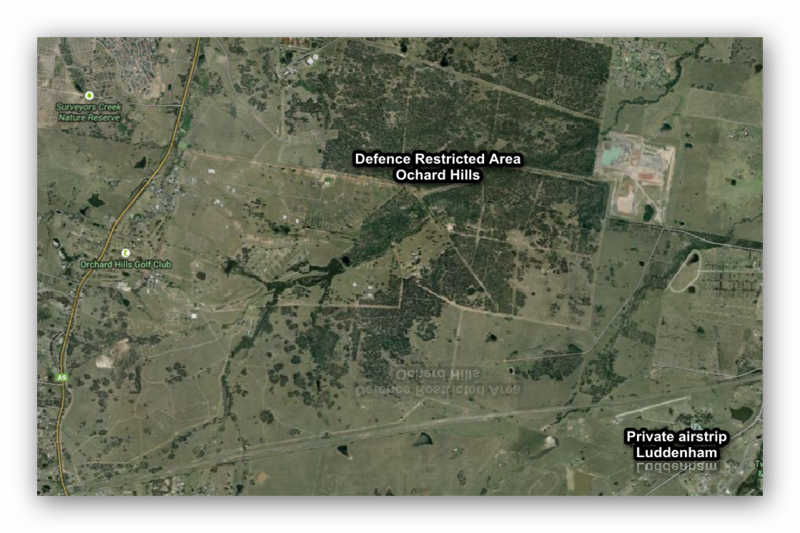 I'll make a bold assumption here that the RAAF site at Bringelly was originally a dispersal airstrip, or possibly an "emergency landing ground"; although details of that airstrip remain sketchy. Was it built? Was it just a mown field? Certainly it is now a telecommunications unit. Or rather was. The full list of Sydney's airfields. It's getting out of hand, I know. We started with Penrith Speedway. Then it was Jamison Park. And Werrington or Brooklands (or 'Frogmore'). Well how about a Paceway? 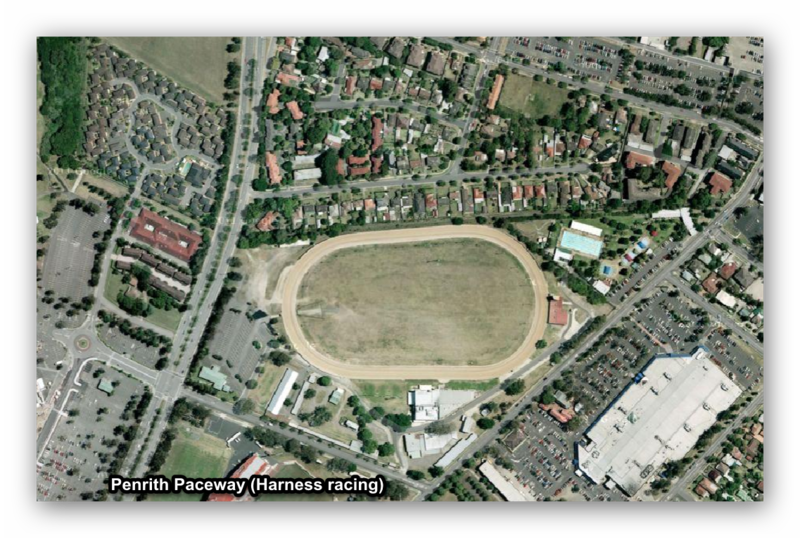 Penrith Paceway, at Penrith Showground. It's been around since before 1943, that much I know. And there must be more to it than that. Yes, it's pacing, or harness racing. No, I don't know what that really means, I've only raced cars and push bikes. Not 1 but 2 speedways. Or maybe 3. Or 4? More? 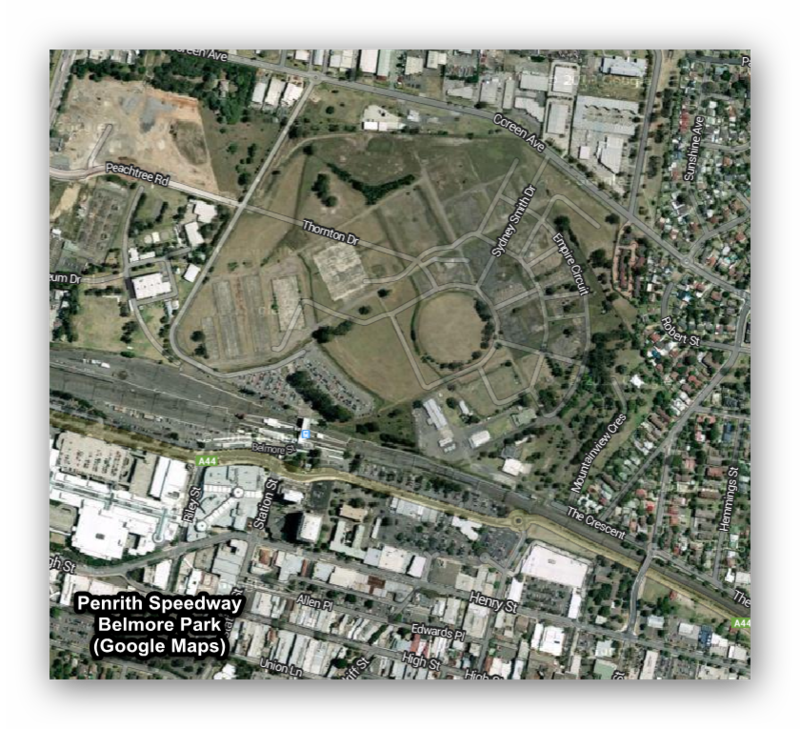 First of all, check out Penrith Speedway, the one in Belmore Park. The one with an airfield. Near Thornton Hall. Just north of the railway station. Or how about this one: Brooklands. Make that 3. But first, the background. As we know it. Or think we know it. 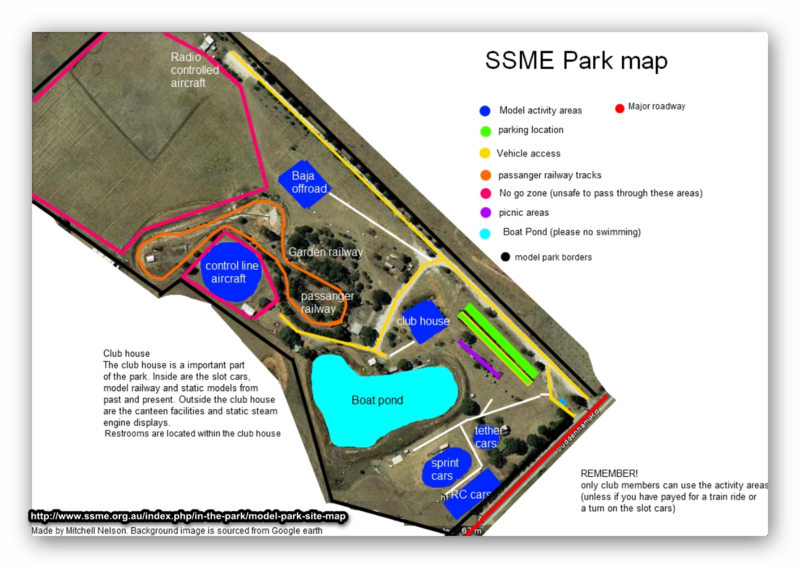 According to the Penrith City records the Western Suburbs Motor Cycle Club approached their local Member of Parliament, Sydney Smith, for the loan of some of his paddocks to hold a race meeting. Smith had quite a bit of land, having inherited Thornton Hall. 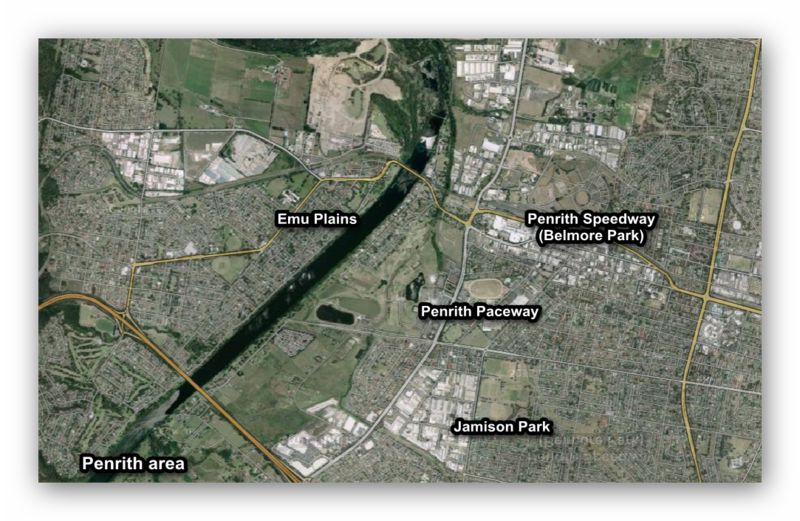 According to multiple records Penrith Speedway was opened on Smith's land in 1920. It was operated by Western Suburbs Motor Cycle Club. It closed in October 1930 because of flooding by Penrith's water supply, something that resulted in legal action by Smith against the Council. It was reopened in 1936 by Frank Arthur of Empire Speedways and ran until 1941 when the Army requisitioned the land. There was a war on, after all. I'm not so sure Smith was the local member, though. 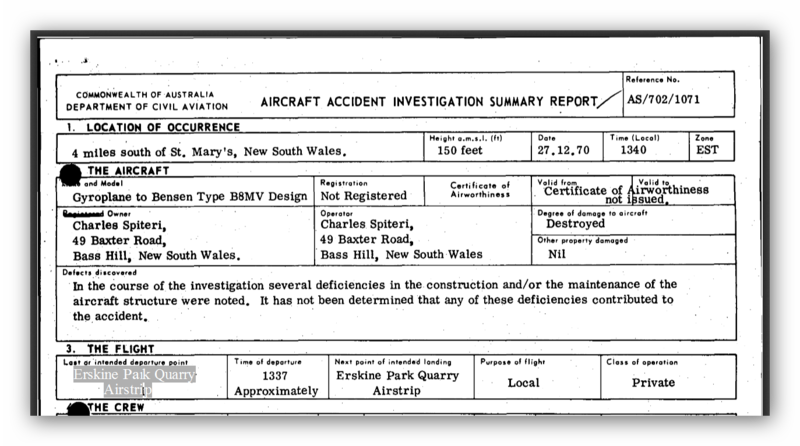 There were 2 "Sydney Smiths", father and son, and whilst both were prominent citizens (the father in particular a serial administrator and politician) neither appears to have been "the local member", at least not at the date assumed. Sydney Snr had retired, for starters, passing away in 1934. So Smith the elder was alive and living in Penrith at the right time, but he had seemingly retired from politics after that 1906 defeat. He had indeed been the local member (the MHR for Macquarie) up to 1906 but not after that date. So technically he was the former member, not "the local member" as umpteen websites suggest. Could it have been his cricket-playing son, instead? Nope. Apparently not. He was big in the world of cricket administration though. Folow that biography link for more on that. There's more on that historic Penrith speedway here. And here. And Library of NSW pics as well. Meanwhile the Brooklands track was constructed - we think - by Victor Sutherland of "Frogmore", apparently up and running circa June 1923, catering for both cars and motor cycles. 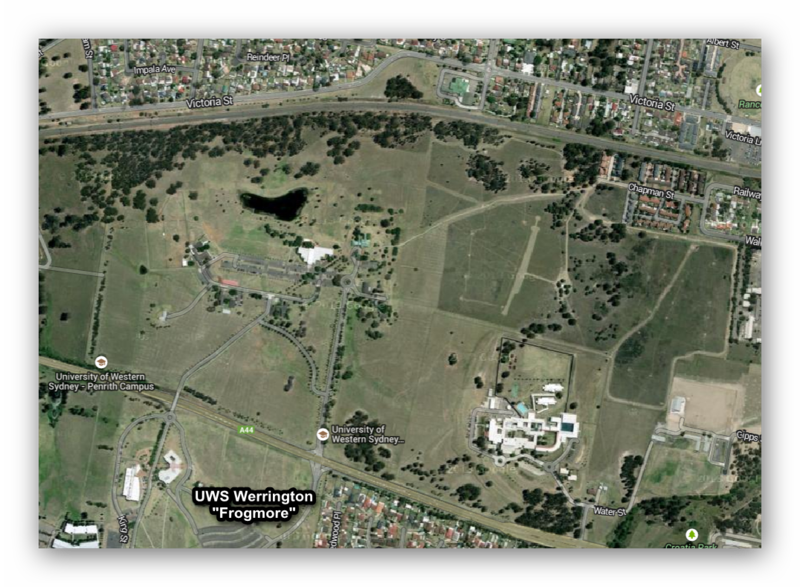 This site was on the eastern part of his property, at what is now known as University of Western Sydney, Werrington Park. No, I can't be sure what - if anything - is left of that speedway. I can't even be sure he owned "Frogmore". I believe his wife did, however. What we do know is that in 1806, 600 acres ('Werrington North') was granted to Mary Putland, the daughter of Governor William Bligh. 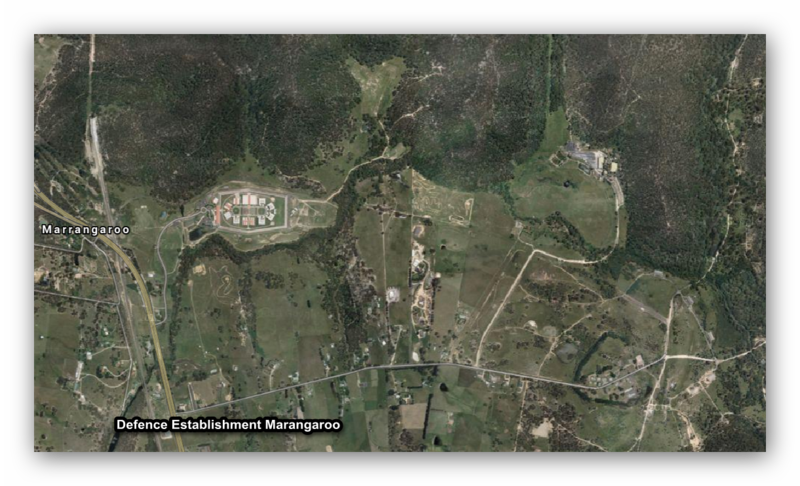 Mary married Maurice O'Connell (then Lt Colonel of Lachlan Macquarie's 73rd Regiment) in 1810, the Governor granting her an extra bonus of 1,055 acres (427ha, apparently named 'Coallee'; now a streetname - a 'Place' - in South Penrith) adjoining what we know to be Frogmore to the south. This grant brought Mary's total holdings to 3,000 acres (1,214ha). Lucky Mary. The O'Connell's main farm holdings were at Riverston(e) but, being rather well off in the manner of these things, they didn't regularly live at either location. Whilst from about 1830 there were certainly house(s) on the site, the O'Connells were actually resident at Woolloomooloo, or abroad. From 1840 the O'Connell's son, Maurice Charles, and his wife Eliza, actually lived for some time on the Frogmore site. After Maurice’s death, however, the site was sold off and subdivided in the 1850s. Now this is where the Sutherlands come into it. Just. Parts of the subdivision were bought and reunited firstly by Caroline Sutherland c.1919, and then by an iron merchant, Alan Williams, in 1935. Between 1919 and 1935 the Sutherland estate hosted diverse uses such as 'vineyard', 'racing track', 'golf course' and 'joy flight aerodrome'. Or did it? Just how many of these activities came to pass may be moot. And the property was in Caroline's name, not Victor's. Not that this was so unusual, of course, but may have been a complication later. 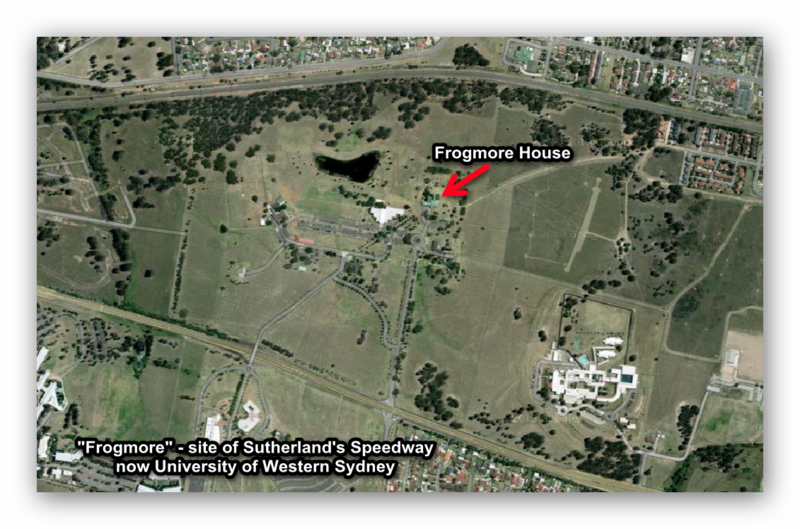 In any case it was Williams who named the "Frogmore" house 'Werrington Park', possibly after 'Werrington Park' in Cornwall, UK. So Victor's vision is a bit blurred - but we can say for certain that he had plans and sought out investors but ultimately only delivered on part of his plan. It was his wife's untimely death that apparently scuttled the full deal. Nevertheless it was a magnificent vision. 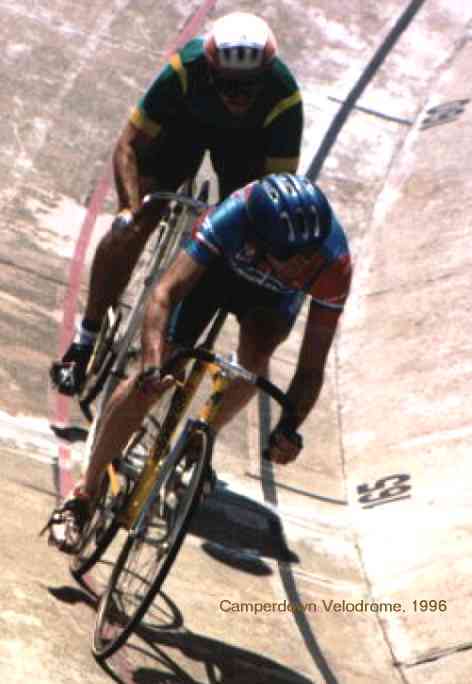 Claimed (presumably by Sutherland and his supporters) to be the "best speedway in the Southern Hemisphere" it was described as a "1.5 mile high-speed banked track for cars and motorcycles". 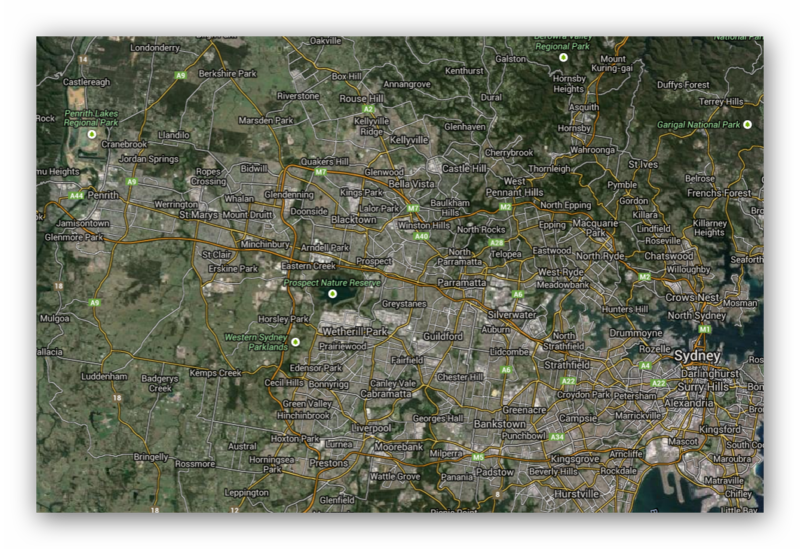 Check out Olympia Speedway, Maroubra, for comparison. It's believed that a one mile (not the expected 1.5 mile?) oval concrete bowl was built but the rest of the venue was never finished. 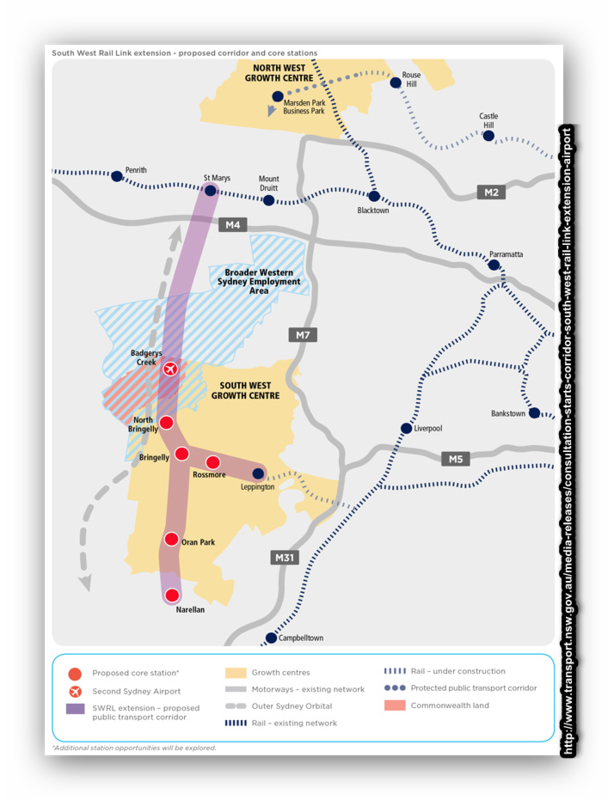 The vision for the complex included the speedway plus an aerodrome and sports fields. Events overtook Sutherland and the vision was never fulfilled. Of course it doesn't end there. 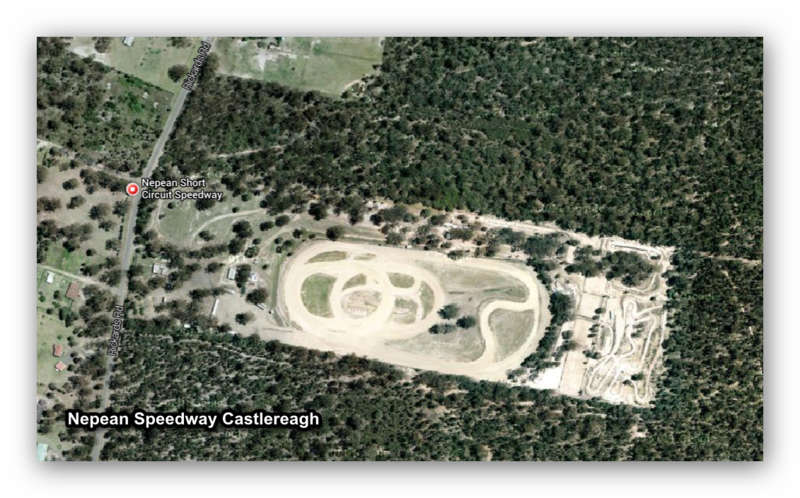 Over the years many racing tracks have come and gone, and today motor racing continues at the Nepean Raceway near Castlereagh. 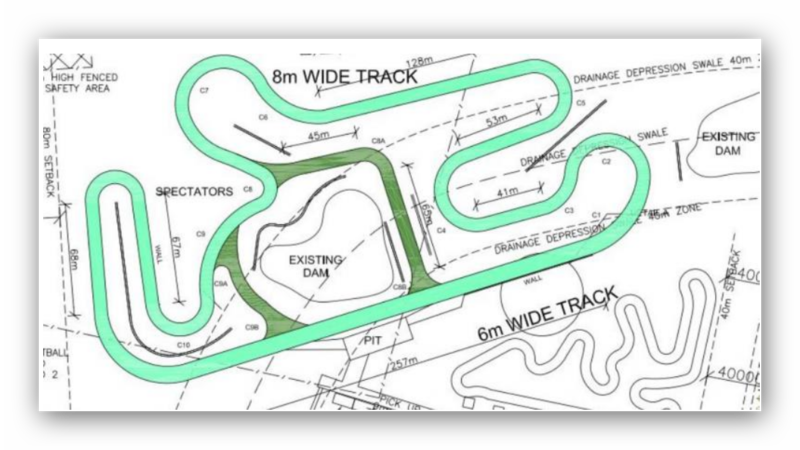 This track was begun in 1959, and today the circuit is owned by a consortium of about eight Sydney Motor Cycle Clubs. Again this is dirt bike racing on a short, tight circuit. 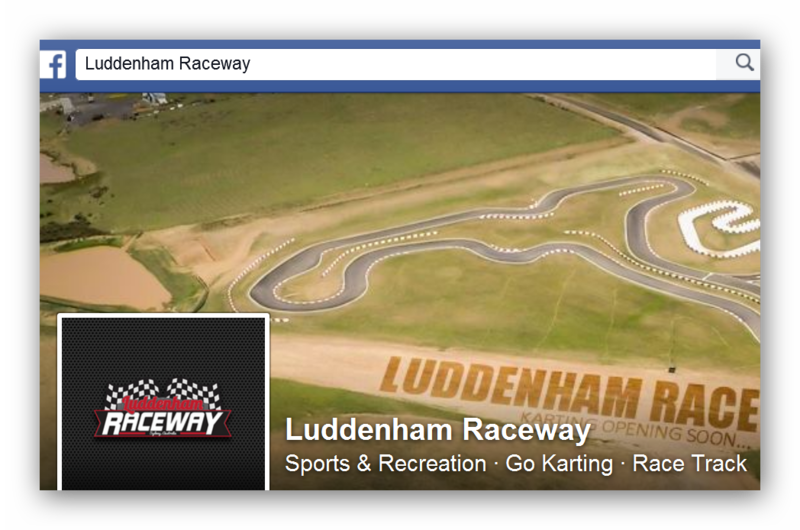 I make that number 4 of this series of Penrith-area speedways. 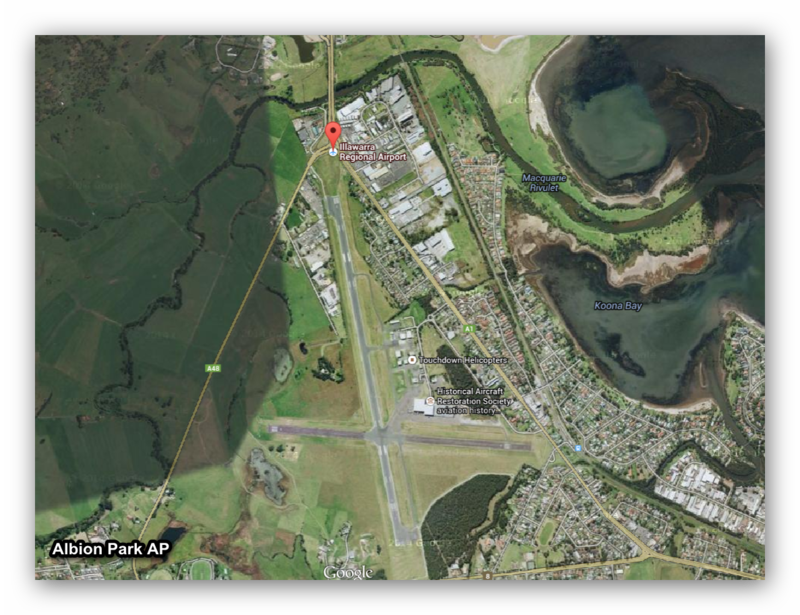 Albion Park: the Illawarra's regional airport, south of Sydney. Albion Park airfield was built in 1941, about 18 kilometres south-east of Wollongong as an RAAF operational base. 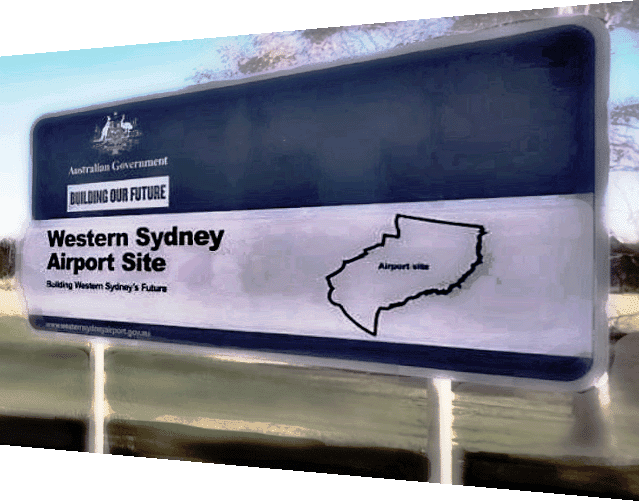 Nearby Cordeaux airfield was constructed in late 1942 (near Cordeaux Dam, a strategic wartime target, being one of the dams supplying Sydney's drinking water) as a dispersal strip and landing ground (maintenance) for its parent RAAF Airfield, Albion Park. 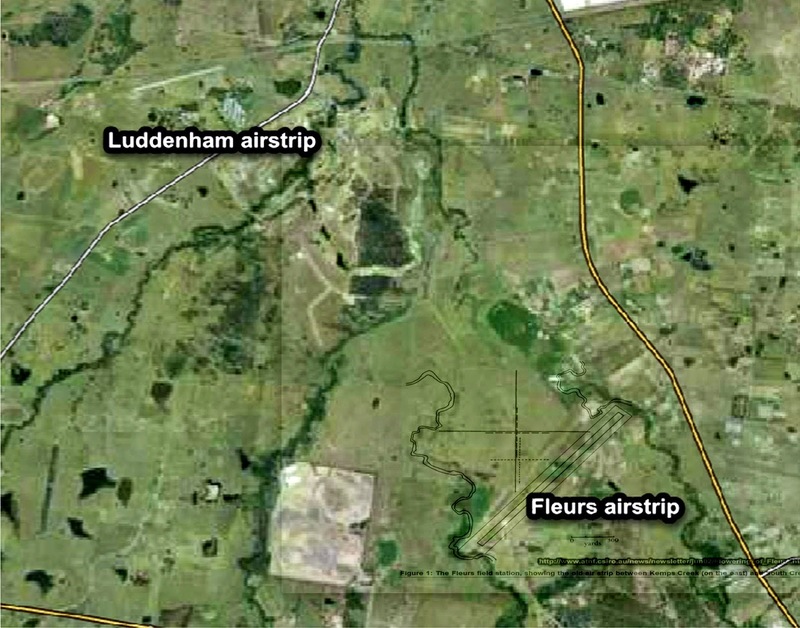 The RAAF's Albion Park airfield consisted of two runways, 4500ft x 150ft and 6000ft x 150ft respectively. 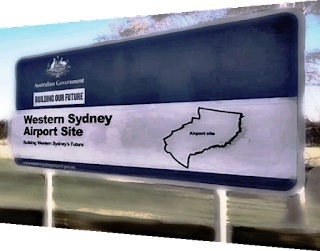 Current airport operator (since 1960) is Shellharbour City Council. The primary runway today is 16/34, with a paved surface measuring 1,819 m × 30 m (5,968 ft × 98 ft). A displaced threshold reduces the available landing distance on runway 34 by 176 metres (577 ft), allowing aircraft to clear high terrain on the approach. 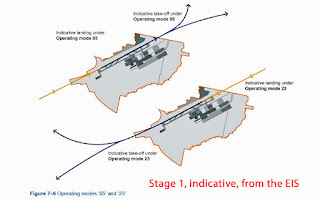 The secondary runway 08/26 is suitable only for day operations as it is not equipped with runway lighting. Sometimes things get mislabelled. This small block of land is an example. That's "Lot 1 DP554845, Cooks Road", corner of Peat's Ridge Road, Calga. 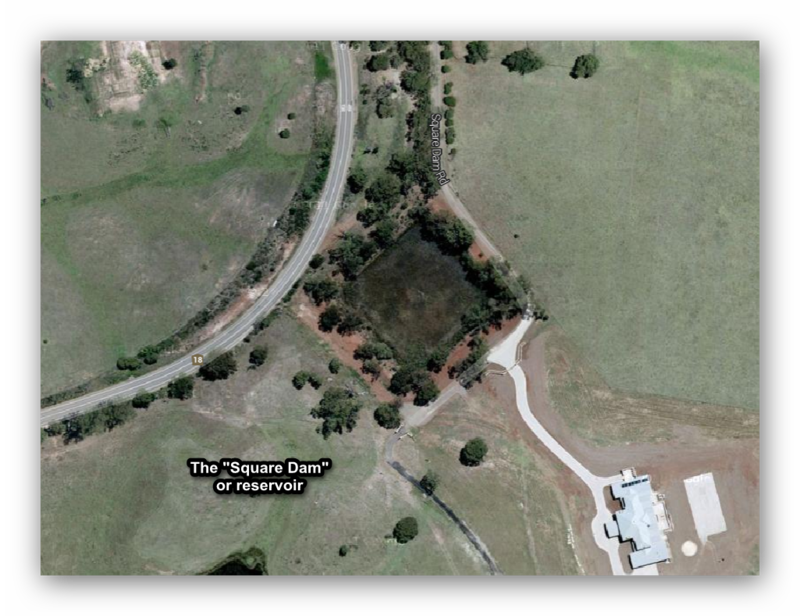 It has been described as a "small property owned by Airservices Australia" that includes "a meteorological station", an "electrical substation" and "a small shed". 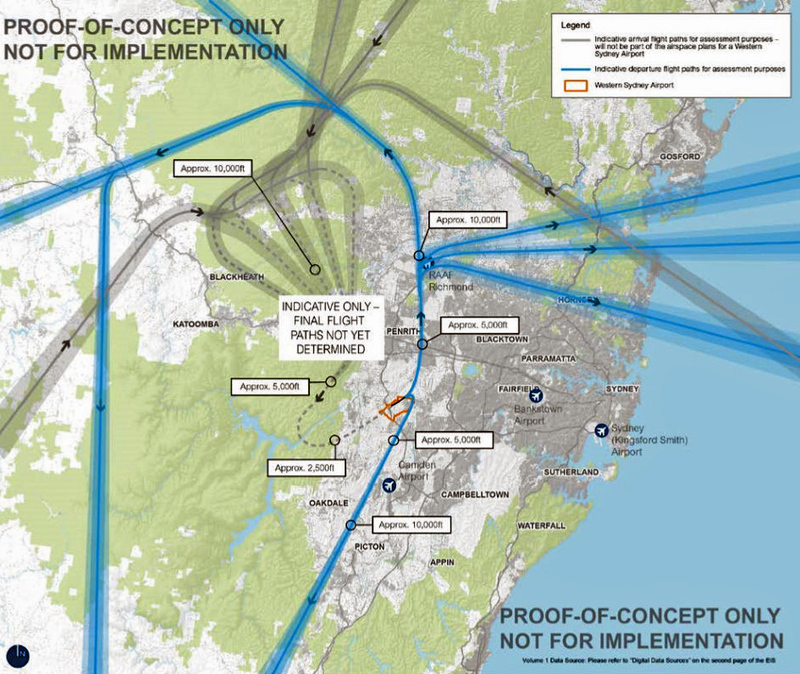 Those towers look excessive for a met station, though. And strangely they are licensed for "radiodetermination", making them "navigational aids" in my book. ADS-B or NDB, if you like. As in "non-directional beacon". Perhaps it has other, hidden, qualities. But it's not an "airport" or even an airfield. Lots of web sites will swear blind that it is, mind. Don't believe 'em. If you ever wonder about what a particular tower (in Australia) is doing or who operates it, the ACMA website can tell you. Just click on the image below to vist ACMA. 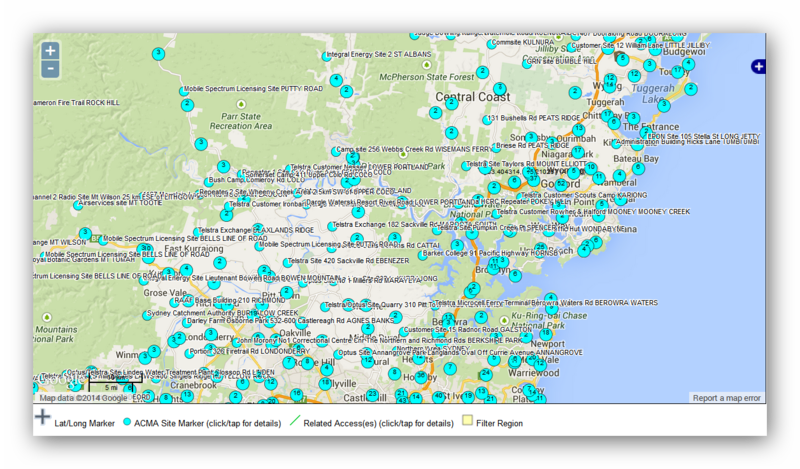 Or check out my list of Sydney's airports and airfields. What exactly are these parents, satellites and dispersal strips? Over the course of time my definitions have wavered and wandered, so here's what I think is a stable set of definitions, for now. 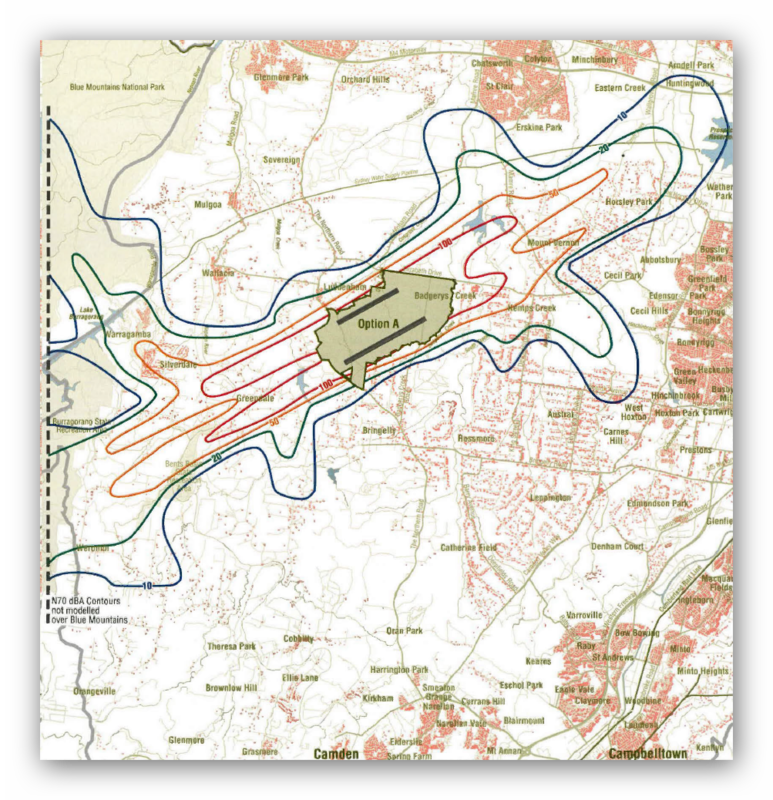 Operational Bases were created in the early part of the war on mainly little used civilian airfields. They were provided with facilities such as water, phone, stocks of fuel and ammunition, but were mostly not staffed with permanent RAAF ground crew. The term's usage seemed to change as the war progressed (but that's just my observation). Other related terms include "Maintenance (Repair and Salvage) aerodrome" and "Training Aerodrome". Camden was a training aerodrome. A parent aerodrome is exactly what it sounds like. 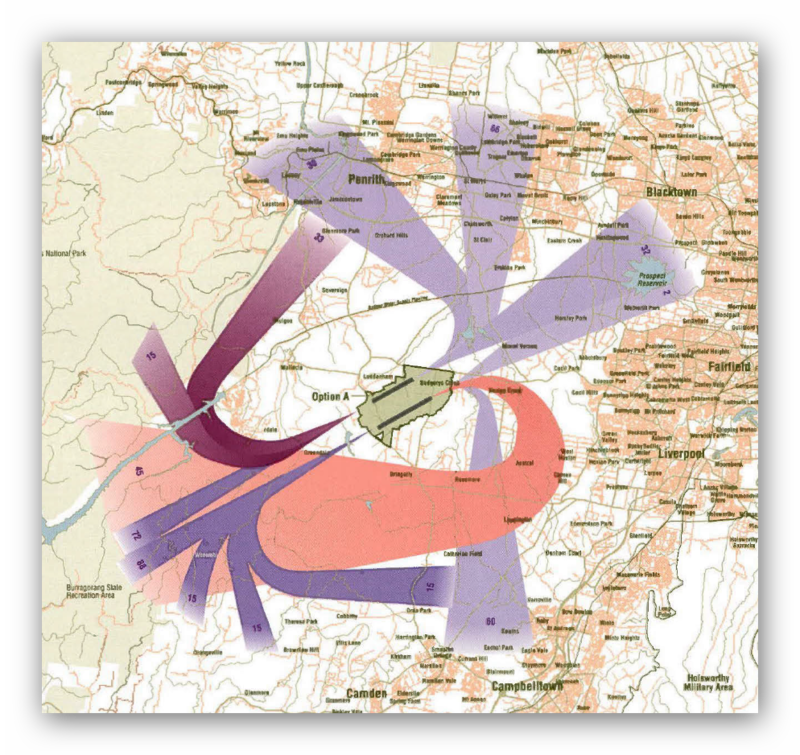 A major operational aerodrome with a number of satellite aerodromes or landing grounds attached. 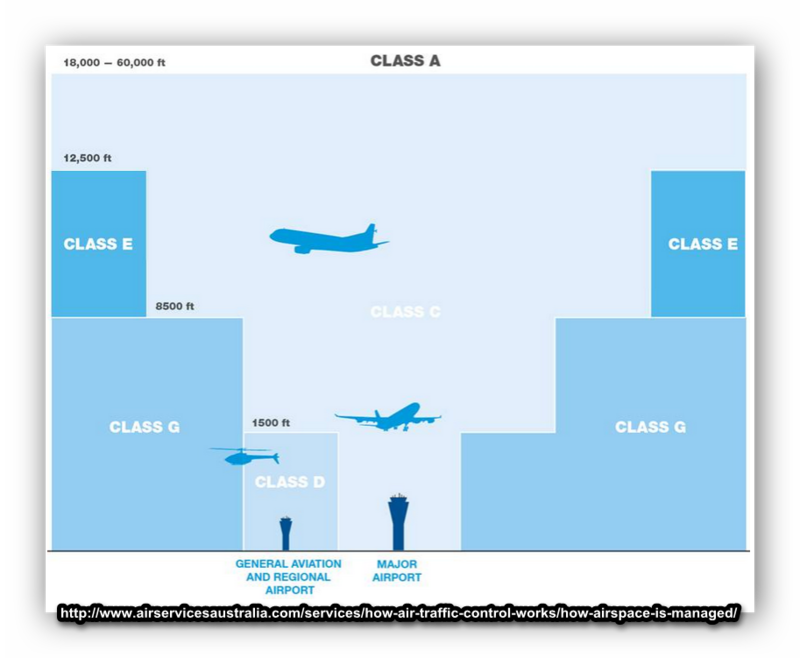 It is possible (with aerodromes, anyway) to have a parent field but no satellite "children", however. See also Schofields, Fleurs or Richmond. A satellite aerodrome is a "child" of a parent aerodrome, normally a major operational airfield, and used primarily to relieve congestion in the circuit area (that's the airspace around the parent where for safety aircraft follow a predetermined approach and departure pattern or 'circuit'). Satellites may also provide other relief, including parking and at times servicing. 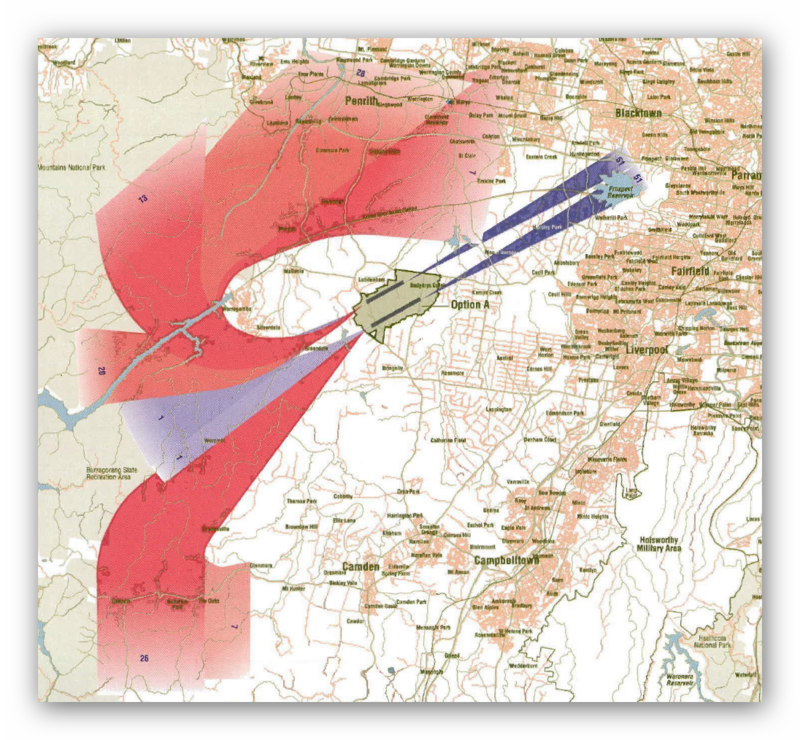 Satellites and 'dispersal' airstrips can become confused, however at times the relationship was clearly set down. 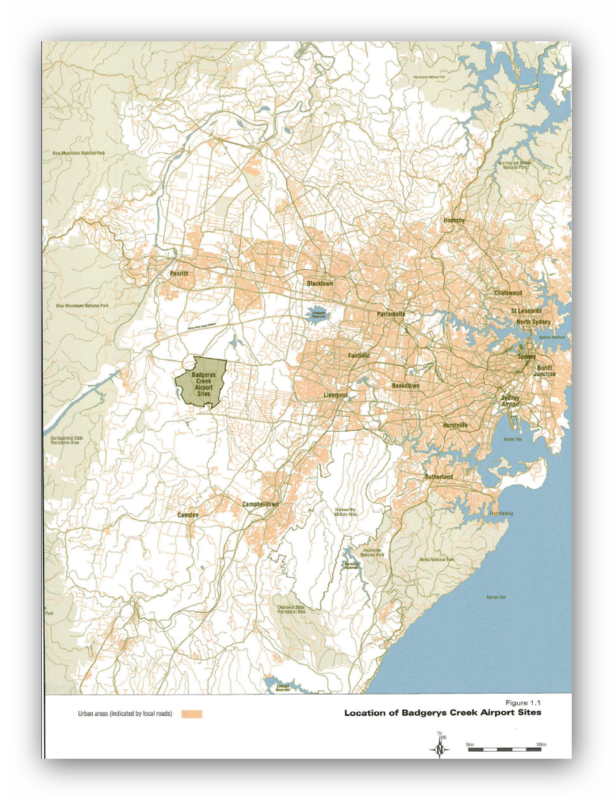 Pitt Town could be considered a satellite of Richmond, for example, or Menangle for Schofields. 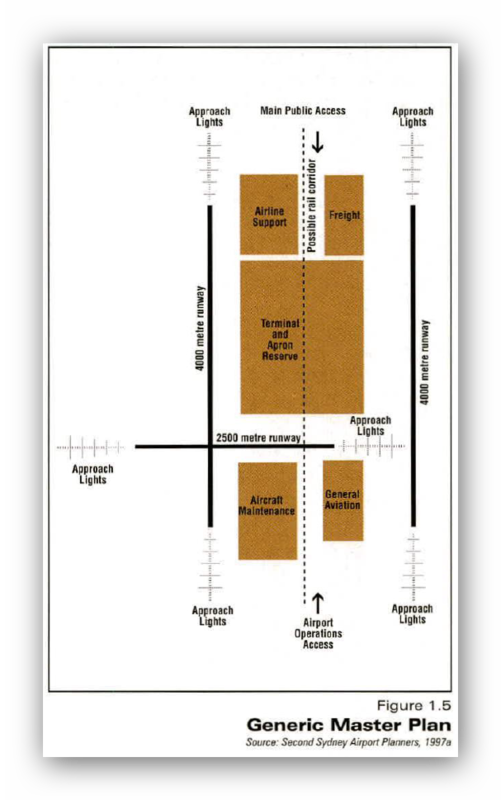 Dispersal airstrips were attached to an Aircraft Depot, Aircraft Park or Operational Base, and consisted of landing ground with revetted (faced, embanked, walled) areas for open (but often camouflaged) storage of aircraft. This was a tactical method to disperse aircraft, thereby reducing the effect of enemy targeting a single aerodrome for air attack. Such strips were provided with the bare minimum of services and no permanent hangars or buildings. Cordeaux is a dispersal strip for Albion Park, for example. An Emergency Landing Ground or ELG is an area of land, prepared and set aside for use by aircraft, but not on a regular basis. As you'd expect, it's for an emergency (engine out, low fuel, bad weather etc). These may be set in paddocks, for example, along strategic air routes. This would not preclude training activities such as "touch and goes" of course. 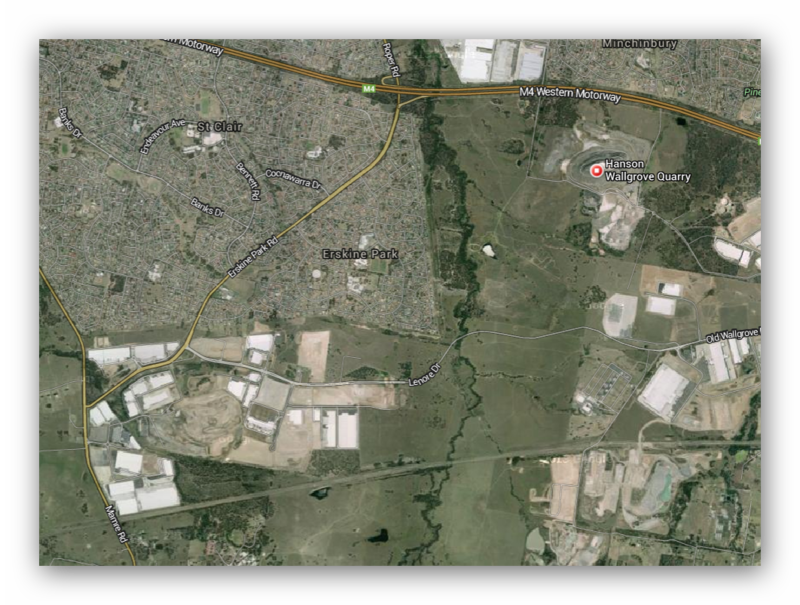 As far as I can tell Tuggerah was such a field, although it may have been considered as or planned to be a satellite (of Fleurs) as well. A Relief Landing Ground is an area of land which has been prepared for regular use by service aircraft. 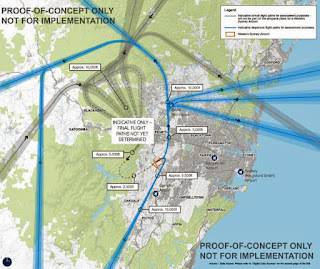 Again, ripe for confusion with dispersal and satellite airstrips. If I can think of an example I'll let you know. An Aircraft Depot was an aerodrome where large numbers of aircraft were stored and maintained. In some cases the aircraft were used for training purposes. Bankstown may be an example (I await correction!). 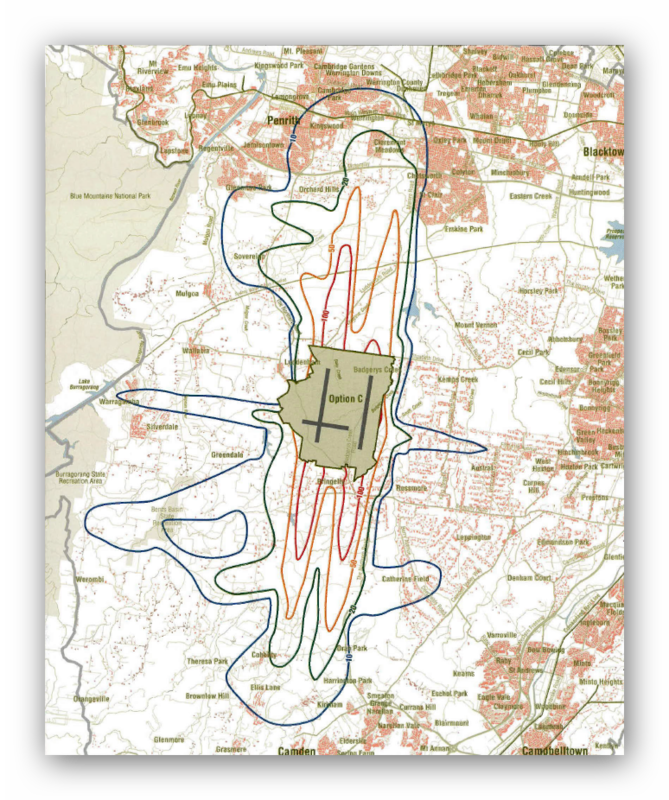 Bankstown was many things, an "air base" for the USAAF as well as an "air station" for the RN. It certainly housed many aircraft, some of which were unused, perhaps not even fully assembled at war's end. An Aircraft Park was an aerodrome where large numbers of aircraft were parked, as in open storage. Such aircraft were used both for operational and training purposes. 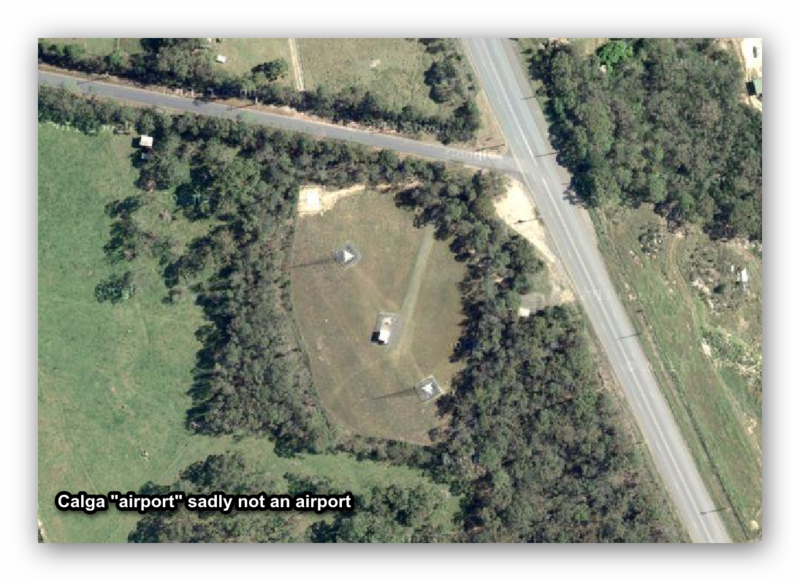 Menangle was an aircraft park for Schofields, for example. However it was also a dispersal airstrip. As I wrote this I found overlap everywhere. Whilst some cases are neat and clear-cut, there are many other examples where airfield use became blurred by operational or training needs. Needs also changed as the war progressed. In any case it's the best set of definitions I can muster right now.